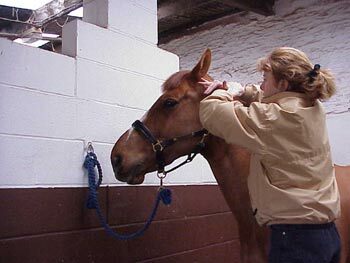 Having graduated from the McTimoney College of Chiropractic, Penny Gunter, BSc (Hons) PG Dip MMA (A), working in conjunction with vets, offers a treatment and rehabilitation service for horses and dogs using chiropractic techniques developed by the late John McTimoney. the muscoloskeletal system, restoring health, movement, soundness and performance. of medical history, diet, exercise and work regime. The spine, pelvis and any other relevant joints are analysed for any misalignments or spasm in the associated muscles. The problem areas are then treated using only the hands, with very precise and rapid adjustments to correct the misalignment and reduce any muscle spasm. Care following treatment usually involves rest and/or limited exercise for a few days. .
Any dog can benefit, but particular breeds and working dogs can suffer injury due to the nature of their work. For example agility dogs can be injured if they land awkwardly; long-backed and short- legged breeds are also susceptible to injury. Some of the signs that may indicate that treatment is necessary include; irregular action, difficulty climbing stairs/getting into cars, reluctance to exercise and stiffness/pain after exercise. owners like it because no anaesthetic or drugs are needed. Treatment following an accident or after surgery can also greatly help the rehabilitation process. 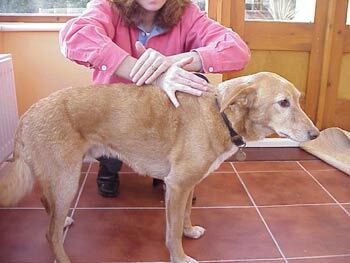 It is important to note that all treatment is undertaken with prior veterinary consent. Based in Wrington, Penny is a fully qualified and registered McTimoney Animal Practitioner treating both horses and dogs.